Decorative Lanterns - Antique Nautical Anchor Lamp - 10"
These beautiful decorative brass boat lanterns are replicas of a 19th Century relic. Although these lanterns are not antiques, they have a superb antique look and are hard to find decorative lanterns. 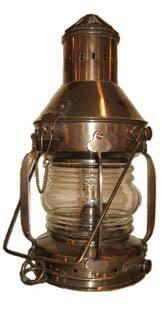 These antique looking lanterns stand 10 " tall without the handle and are 4.5" wide. The oil burning pot and wick unit are serviced from the bottom of the lanterns and can be converted into electric fixtures with great ease. There is room inside for a full size light bulb after conversion. Some applications include, ships wheel chandeliers, exterior lighting on property, ceiling fixtures, end table lamps and they also make a perfect patio/deck oil burning lamp. They are very sturdy and weigh nearly 4 lbs each. Available in bulk for wholesale rates.